Development series of manipulators for furnace lining destruction – Strojírny a stavby Třinec, a.s.
Development and production of destruction and demolition manipulators for foundry operations for the destruction of furnace lining shells, torpedo mixer soaking pit furnaces etc. By using manipulators in production, work productivity improves markedly and heavy, dangerous work, harmful to health, is removed. 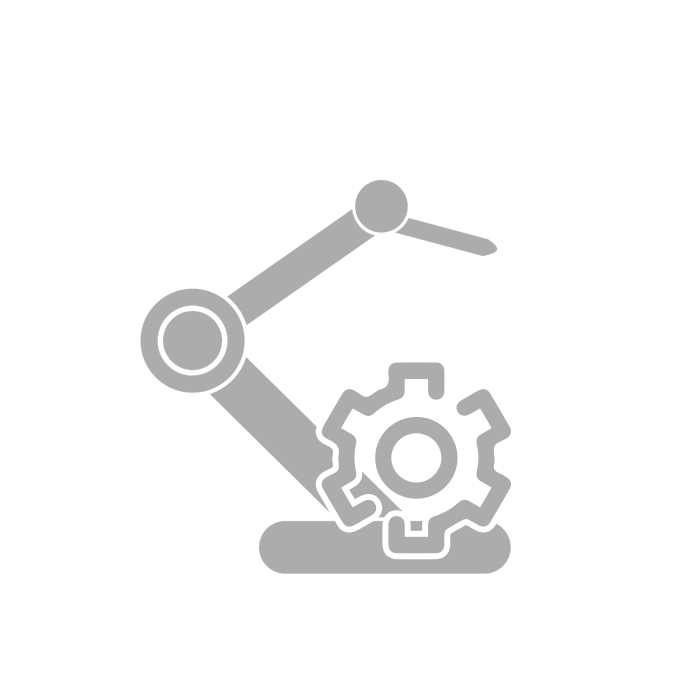 We are able to adjust all technical parameters of the equipment accordingly. This universal manipulator is designed for the destruction, demolition and division of very hard materials, such as slags, concrete etc. This equipment works particularly in foundries when slag is cut, for bricks in soaking pit furnaces, when destroying foundry ladles etc. The advantage of this manipulator is that it may work in the hardest conditions such as radiating heat, dust etc. 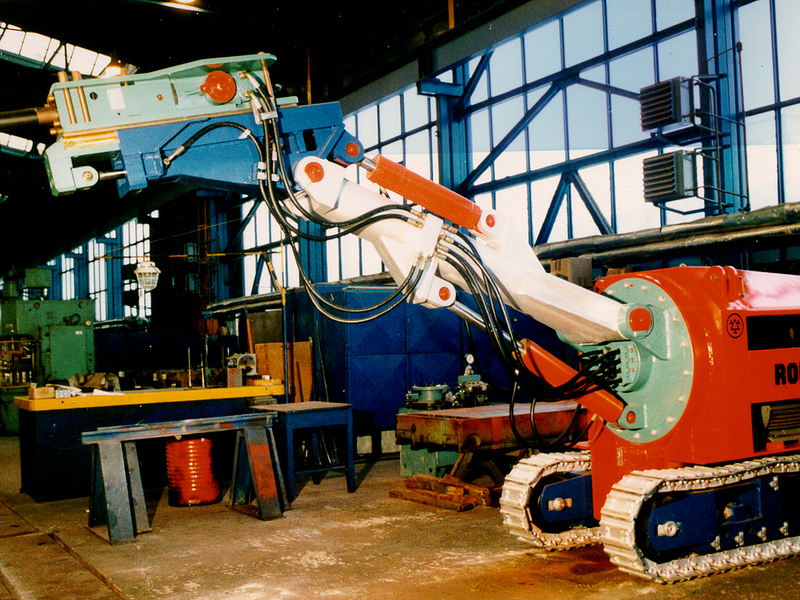 A type of demolition manipulator, serving mainly for the destruction of worn refractory linings and castings of ladles. 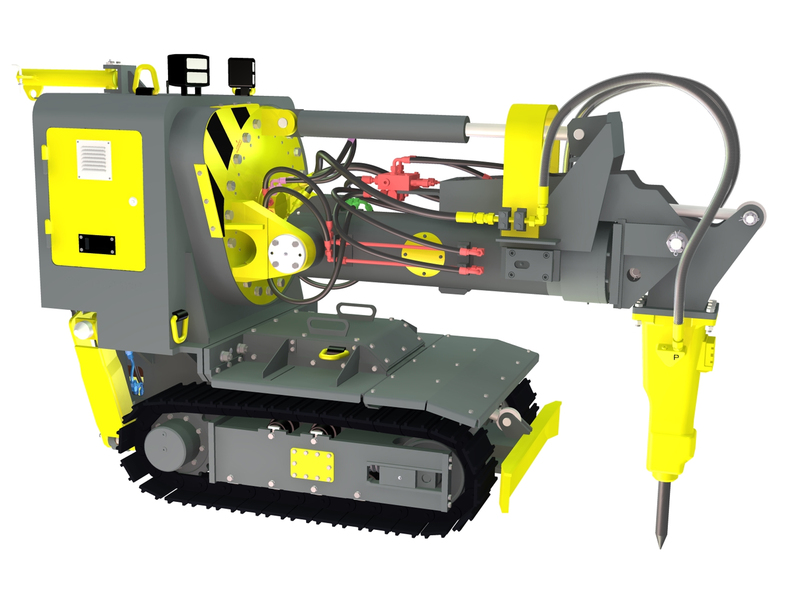 The manipulator is equipped with a foldable arm with a hydraulic hammer at the end, for the destruction of furnace lining in the range of 360°. The robust machine structure allows equipment carrying, causing significant vibrations. The machine is remotely controlled up to 20 m away. For its small size and high stability on rugged terrain, the manipulator is appropriate for works in small areas. 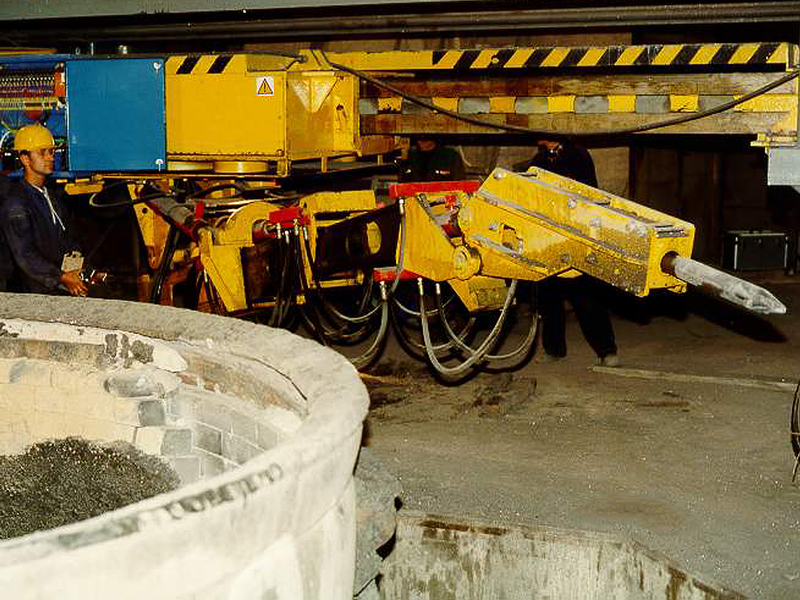 The manipulator also serves the demolition of worn refractory linings and castings of ladles. The newest and larger model ROMAN 02/B, has higher performance. The advantage of this manipulator is that it may work under the hardest conditions such as radiating heat and dust, under a max ambient temperature of 80 degrees. 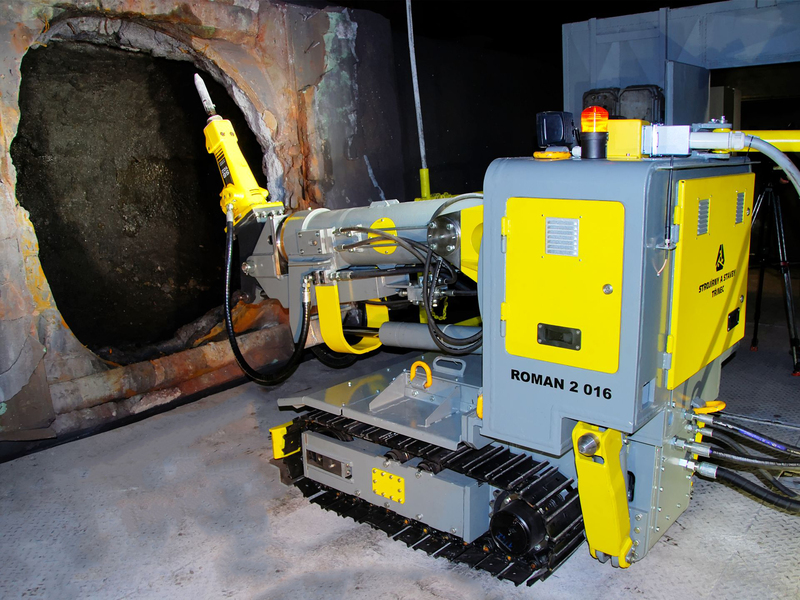 The manipulator is equipped by a foldable arm with a hydraulic hammer at the end, for the destruction of furnace lining in the range of 360°. The machine is remotely controlled. This innovative type of demolition manipulator serves for the destruction of worn refractory linings and castings within travelling mixers, transporting raw iron. The manipulator is particularly designed for extremely small and confined areas, where other mechanisms can’t operate. For this reason, the hydraulic device is placed outside the machinery. The machine is remotely controlled up to 20 meters away. 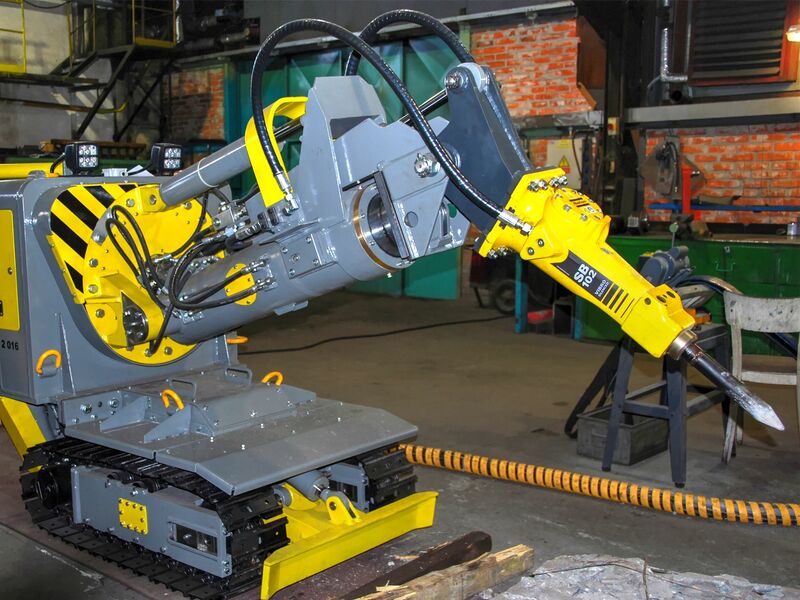 The manipulator is equipped with a foldable arm with a hydraulic hammer at the end, for the destruction of furnace lining in the range of 360°.